How can the UK, as a nation, put up with Boris Johnson any longer? He is no representative of the people. He is, quite simply, a thug with an expensive education. Yesterday – October 3 – he managed to shame us all, not once, but twice. Note the toadying laughter of the Tory faithful, proving beyond doubt that they are not worthy of high office. Sirte was the Libyan city where the country’s former leader Muammar Gaddafi was killed. Shadow Foreign Secretary Emily Thornberry called for Mr Johnson to be sacked: “It is less than a year since Sirte was finally captured from Daesh by the Libyan government of national accord, a battle in which hundreds of government soldiers were killed and thousands of civilians were caught in the crossfire, the second time in five years that the city had seen massive loss of life as a result of the Libyan civil war. They weren’t playing politics; they were seriously denouncing Mr Johnson for playing the fool about people’s lives. This is not the first time the foreign secretary has behaved offensively to other nations – he had to be stopped from inappropriately quoting a colonial poem by Kipling in Myanmar recently. He was referring to Mr Johnson’s intervention in the Brexit process in which, adrift from his party and its leader, the foreign secretary announced four “red lines” – conditions without which he said the UK should not leave the EU. He was also speaking in support of a motion that was highly critical of the UK’s behaviour during the Brexit negotiations. It said the talks had not made sufficient progress to move on to the next stage of talks, and was upheld by 557 votes to 92 against, with 29 abstentions. He has claimed that his £141,000+ per year salary is not enough to live on, in what many believe to be an out-and-out challenge to Theresa May’s leadership (and an insult to the vast majority of the UK’s population, who have to make do with much, much less). Mrs May herself has proved too weak to tackle the issue. 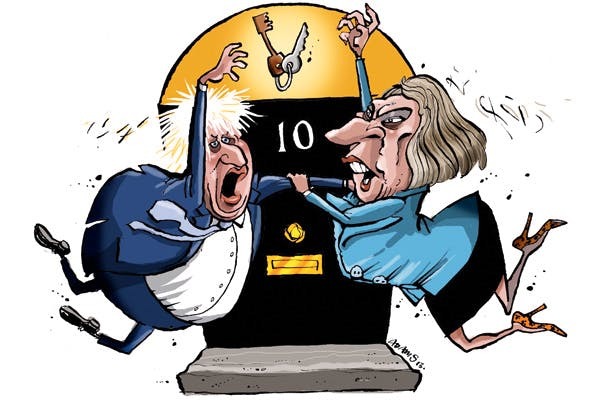 Speaking on The Andrew Marr Show on Sunday (October 1), she ducked the question of whether Mr Johnson was “unsackable”, saying her cabinet was “united”. Perhaps she was trying to redefine the meaning of the word. After all, Jeremy Hunt tried to rewrite the history of the National Health Service, to claim that it was a Tory idea (in fact the Conservatives voted against it 22 times). Tories will say anything if they think it will win them an advantage. If so, then – as with Mr Hunt’s comment – her logic is twisted. She has not won an advantage. She has turned herself, her party, her government and her nation into an international laughing-stock. And she reckons she’ll turn it all around in her speech today (October 4). Considering her performance since becoming prime minister – no, since becoming home secretary in 2010 – it seems such a feat will be beyond her abilities. Theres no doubt the english upper classes…so called…are litteraly the most…grotesque ….and repulsive people on the planet boris is the kind of upper class super grotesque who i bet dosent wipe his **** after haveing a dump…repulsive…a couple of years ago i worked with a builder on a 10 million pound house in fulham london owned by thease upperclass english ****holes….all that money all that chouise in life…they lived in filth like pigs the most ignorant deviouse scumbags we ever came accross with no shame no morals…the hand was allways out palm up….allways wanting more. Johnson is an odious, loathsome, uncouth and ignorant slob. Never mind a high office of State, this man is unfit for a job as toilet cleaner. Well the reason that the negotiations are not moving on isn’t the fault of the UK it is the eu with its ridiculous claims, for a huge amount of money before it will talk, although this is clearly illegal, under their own legislation. The eu parliament is window dressing it is advisory only and weird no real power for for that matter influence over the unelected executive commission. Hi Barry, I have to agree with you, if the UK is it’s citizens, not politicians, and of course your correct in that it’s the ‘eu’ eunuchs of the tories with their ridiculous claims. Bungling Boris, the Tory Clown does it again. Thousands dead in Sirte and it’s a throwaway glib remark to earn him a cheap laugh. Hands up all those who think the death of soldiers and civilians is a joking matter – Tory supporters – please try and curb your enthusiasm if your answer is “yes”. Boris Johnson was a RUBBISH mayor and he’s rubbish now! What goes through the man’s mind? Diplomacy, man! I couldn’t agree more with that E.U. politician. For SHAME, Theresa May! For SHAME!